The President of the United States is the head of state and head of government of the United States, indirectly elected to a four-year term by the people through the Electoral College. The officeholder leads the executive branch of the federal government and is the w:commander-in-chief of the United States Armed Forces. 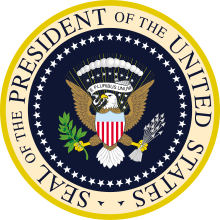 Listed here, are the Wikiquote articles for Presidents of the United States along with their terms in office, in chronological order.